Packers win the Super Bowl! Four sailors were killed today. Jean and Scott Adam, Phyllis Macay and Bob Riggle became the first Americans to be murdered by Somali pirates. They were sailing the Adams' 58-foot yacht, Quest, several hundred miles south of Oman last Friday when they were boarded and taken hostage. U.S. warships intercepted the pirates as they steered the Adams' boat toward Somalia and attempted to negotiate the hostages' release. Earlier today, for unknown reasons, the pirates believed they were under attack. They fired a rocket-propelled grenade at one of the warships and then killed or mortally wounded all four hostages. U.S. troops moved in, killed two of the pirates and captured the rest. When I heard this story on the radio this morning while driving to work, I couldn't believe it. As a sailor myself, I have been closely following the piracy situation in Somalia for years. It started in the early 1990s with commercial freighters cruising close to Somalia's shores, but lately it seems that any-sized boat in the Arabian Sea is fair game. In October, 2009, when I heard about Paul and Rachel Chandler, the British sailing couple who were taken hostage in the Seychelles, more than a thousand miles off the coast, I thought that things had gotten completely out of control, but today's tragedy takes it to unprecedented levels. Farah, the pirates' leader, has vowed revenge on America for his lost comrades and his lost investment in the botched operation, which he claims cost him $110,000. His gall is unconscionable. If there is to be any revenge, I believe it will be by America against him and his comrades. Enough is enough. About a year ago, I came to grips with the fact that my cherished L.L. Bean golden retriever baseball cap was past its prime and in need of replacement. I searched the Internet for another one, without success, and went with Plan B instead. As a lifelong Green Bay Packers fan, I thought maybe I could find a decent-looking team cap, but most were downright hideous. Then I happened to see Brett Favre walking the sidelines during the Vikings-Packers game wearing a simple beige cap with the Minnesota Vikings logo on it. 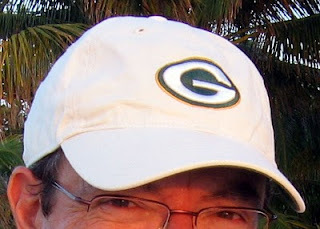 I thought, if I could get that cap with a Packers logo, I'd wear it with pride. I found it at the Football Fanatics website, ordered it and have been wearing it ever since. What does a baseball cap have to do with the Packers winning the Super Bowl, you ask? Well, back in September, when Nan and I were in Isla Mujeres, we whiled away an afternoon drinking margaritas and watching the raindrops drip off the palapas at Chuuk Kay, the new restaurant where our Isla buddy Ventura works. A gentleman at a nearby table was also wearing a Packers cap and we happened to pass on our way to and from the baño. I mentioned that the Packers were looking pretty good this season. They had beaten the dreaded Chicago Bears earlier in the week, a game we had watched at Brisas Grill, where our good friend Juan works, and I was feeling pretty positive about their prospects. He nodded in agreement, so I told him how I really felt: "They're Super Bowl bound!" Maybe it was the margaritas going to my head. He shook his head and said he didn't think there was much chance of that happening. We went our separate ways. Well, I'm not much for saying I told you so, but boy oh boy! So I'll just say this: "How 'bout dem Packers, eh?! You gotta believe!" Oops! The Packers actually lost that game to the Bears in September, but the Packers led most of the game and it came down to a field goal at the end. 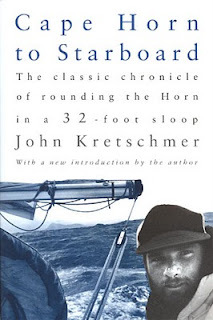 I recently finished reading my friend John Kretschmer's first book, Cape Horn to Starboard: The Classic Chronicle of Rounding the Horn in a 32-foot Sloop. It had been out of print for a few years, but it was republished last fall with a new introduction and afterword. I have enjoyed all of John's other books, so I was excited to read this one. It didn't disappoint. In the fall of 1983, when he was only 25 years old, John and his crew sailed a Contessa 32 from New York to San Francisco by way of Cape Horn, replicating the route of the nineteenth-century clipper ships. His youth and relative lack of sailing experience proved to be an asset, as he didn't know what he didn't know, or he never would have considered such a crazy adventure. As John wrote to me in an email message last week, "Rereading the galleys I was amazed at my own audacity, what was I thinking?" The feat gained him and his crew instant fame for sailing the smallest boat to date around the Horn. John states modestly in his afterword that their arrival in San Francisco must have occurred on "a slow news day" based on the grand reception they received from Mayor Dianne Feinstein and the local news media and later from Dan Rather and CBS News. When the commotion died down, John embarked on a career as a delivery captain, which is detailed in his second book, Flirting with Mermaids: The Unpredictable Life of a Sailboat Delivery Skipper. John and I are the same age, so as I read his book I couldn't help but think about what I was doing with my life while John was sailing around the Horn. All I was doing was trying to get a second degree, in engineering this time, and working part-time at a Milwaukee hospital, where I met my future wife, Nan. My greatest ambitions revolved around planning annual backpacking trips with my friend, Dave Beckwith. 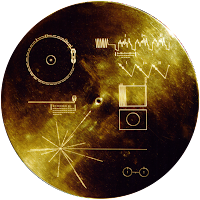 It all seems so "small potatoes" compared to what John was doing. Maybe, at an unconscious level, that's why my ambitions now are so, well, ambitious.